Historic preservation inspired the creation of our custom furniture featuring sections of vintage reclaimed railroad steel. CARNEGIE, a name synonymous with the modern arts, theater, and libraries across the United States, has its origins in the Industrial Age as evidenced by its regular appearance on sections of steel with a rich patina in the fine furniture we craft. Pittsburgh and New York foundries that were owned by the iconic railroad tycoon Andrew Carnegie rolled steel in the Industrial Age. We collect and preserve that vintage steel made in the USA in the late 1800s and early 1900s. Home or office, the industrial era brands on heavy steel in each piece we craft become the centerpoint of conversation in a room. Rich in history and meticulously documented, we authentic and preserve the story behind the materials so that our clients can share those stories as well. Reclaimed steel rails and hardwood timbers - waiting to become history in custom railroad inspired furniture. Our steel comes from the depths of the earth - iron ore mined in places like Pittsburg, Pennsylvania, and Birmingham, Alabama. Proud hands rolled the date of manufacture and batch numbers into each rail during what became the dawn of quality control. This metal speaks of such a quality that names like Carnegie, remain forever immortalized in the web of the rail. Recycled hardwood timbers - never used or treated with chemicals. 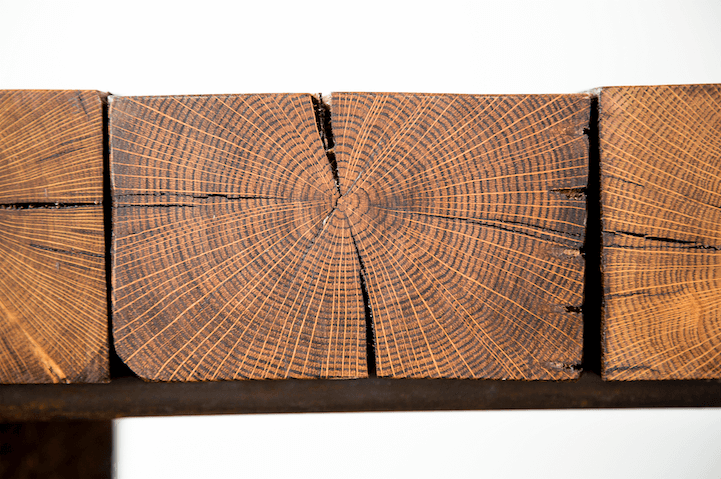 Our wood remains naturally creosote-free even though they are of railroad crosstie origins. Untouched by chemicals, we use culled cross ties – lumber that won't pass grade due to an imperfection. While those features make those ties less than ideal for running 180,000-pound rail cars over them, they add great character to our pieces. So we save them from a lesser fate and give them new life in the service of our clients. Real date nails recovered by our crews. The year stamped on the head is the year that rail section was installed. We drive one in on each piece we create.